Voyager Mini tabletop display. 3 panel briefcase fast folding. Detachable graphics allow for easy changes! 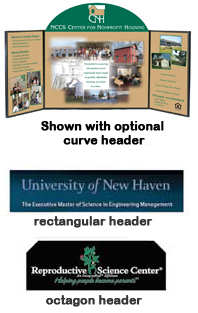 Extra show graphics can be stored in the display case for easy storage. Open dimensions 18"h x 48"w.
Voyager Mini Fast Folding Tabletop Briefcase Display 3 Panels. Weighs only 5 lbs. Great for any trade show or event. Open dimensions: 18"h x 48"w.